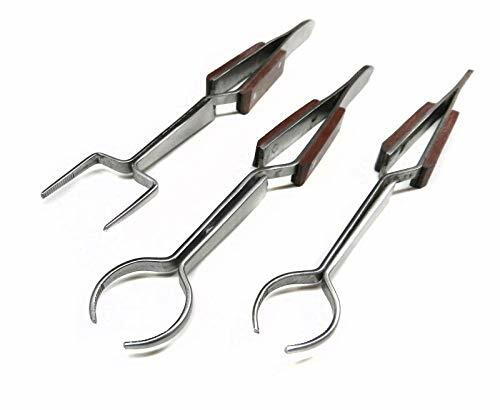 FIBER GRIP CROSS-LOCK TWEEZERS SET OF 3 SPECIAL SHAPES - 2-ROUNDS & 1-SQUARE FOR HOLDING ROUND CIRCULAR PARTS - SQUARE & RECTANGULAR DISCS Tweezers are the latest addition to the Cross-Locking Fiber Grip Tweezers line. Fiber Grip Tweezers are used by Jewelers, Model Makers, Hobbyists, in the Electronics field, by Watchmakers and for Craft and Glass work. Tweezers can be used by individually by themselves or can be attached to a Third Hand Base, very durable, made of Stainless Steel and has Heat Resistant Fiber Grips to protect fingers from heat build-up when using in soldering and welding operations. The LARGE ROUND shaped tips can be used to hold Spherical pieces: Round, Circular, Rods objects. The round open end tips are 3/4" in diameter width and extend to an opening of 1-1/2". The round tips are very useful for holding Circular parts around the majority of the diameter rather than at only minimal points of the object. Tips of the tweezers have serrations and be used to pinch and hold objects. The SMALL ROUND head has rounded open mouth, used to hold Round, Circular, Rods objects and pieces. The round open end tips are 11/32" in diameter width and extend out 11/16". The formed tips are very useful for holding round items and parts, the tips of the tweezers have serrations. The SQUARE Shape has a fork style head, with the holding tips have a wide open square mouth , used to hold large or wide parts and pieces. The open end tips are 7/8" wide and extend out 1-3/32", are very useful for those wider and square or rectangular pieces, the tips of the tweezers have serrations. If you have any questions about this product by Novel, contact us by completing and submitting the form below. If you are looking for a specif part number, please include it with your message.